According to the USDA, between 250 and 300 million turkeys – 6 billion pounds – are produced in the US each year, with more than 16 pounds of turkey consumption per capita. About a fifth of this total is consumed just at Thanksgiving! Minnesota, North Carolina, Arkansas, Missouri and Virginia are the top five turkey-producing states. Each year in the US we celebrate the Thanksgiving holiday, acknowledging the celebratory feast held by the Pilgrims in 1621. In keeping with tradition, many of us still celebrate with a feast — typically with turkey as the feature food. Turkey is also a popular item for other holiday meals, and throughout the year, with consumption increasing over the last decade. The United States is also the largest exporter of turkey products, another growing distribution channel, seeing a 14% increase from 2011 to 2012. With all that said, where does Apache fit into a turkey feast? 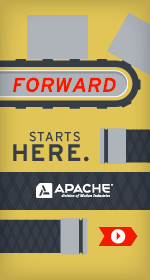 One of the leading belt lines for Apache is Volta Belting Technologies. We partner with Volta to provide a full line of Volta products for food processing. For turkey processing centers, Volta is a clean and quick solution. This homogeneous line of belting is one of the most commonly used products for de-boning, cross carry conveyors, metal detectors, transport conveyors, slicers, dicers, and chiller take-away lines. The SuperDrive™, DualDrive, and flat belt products provide the best solutions for these applications. When your customer is looking to replace modular product, super drive and dual drive are the answer. Volta’s blue color is easily detected for better on-line quality control. Available in either cream or blue, this product holds up extremely well in constant wash-down environments. An 8 mm thick cleat is available for inclines that take a lot of abuse, with the heavier cleat providing more back rigidity. All fabrication of these belts is via high frequency or “HF” technology, which bonds together the belt polymers. This method of welding strengthens and seals the fabrication completely. The crescent top product is a great solution for a “butterfly” slicer line, and the blue meat cleat profile is ideal for raising the meat up off the belt. Since safety and hygiene of your conveyor belts is essential to ensuring food safety — Apache is your answer!